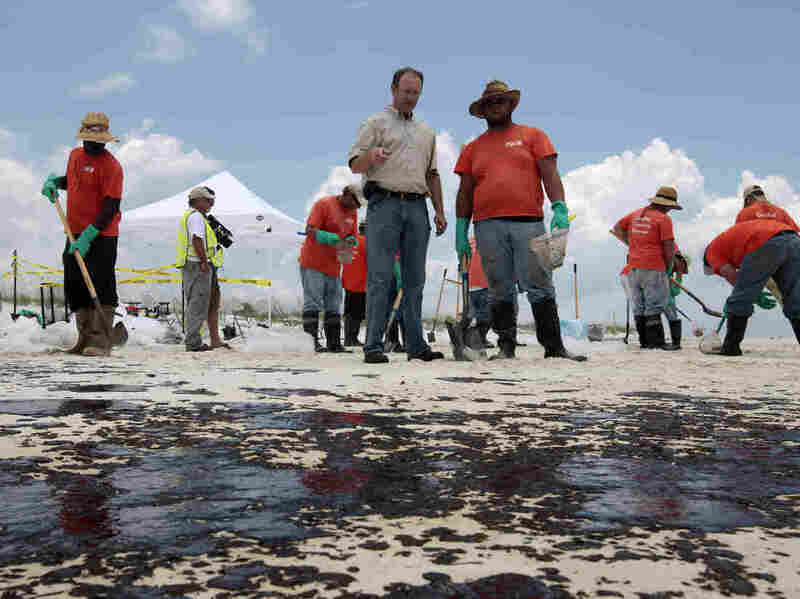 BP Exec Who Led Cleanup Settles On Charges Of Insider Trading : The Two-Way Keith A. Seilhan, who was the incident commander directing the company's cleanup effort, allegedly sold $1 million in BP stock based on nonpublic information about the extent of the spill. BP Mobile Incident Commander Keith Seilhan talks with oil cleanup workers in Gulf Shores, Ala., in July 2010. Seilhan has settled with SEC regulators who say he avoided $100,000 in stock and options losses by trading on inside information related to the spill. A former BP executive who led the company's cleanup of the 2010 Deepwater Horizon oil spill has agreed to pay $224,000 in penalties and restitution in a settlement with the Securities and Exchange Commission for allegedly trading on inside information on the disaster. SEC regulators say Keith A. Seilhan, 47, a 20-year veteran of BP plc, sold his family's $1 million portfolio of BP securities after learning that the public estimates of the extent of the Gulf of Mexico spill were grossly underestimated. The regulators say the sale of the stock and options saved Seilhan from more than $100,000 in losses. Seilhan has agreed to pay a $105,409 civil penalty and the same amount in "ill-gotten gains," as well as more than $13,000 in prejudgment interest, Reuters says. "In his position as Incident Commander [in Houma, La. ], Seilhan learned of nonpublic information relating to the seriousness of the disaster, including initial oil flow estimates from the sunken rig that were significantly greater than the public estimate of 5,000 barrels per day. Indeed, those private estimates were between 52,700 and 62,200 barrels per day — a 10x increase than that provided to the public. "After he learned of this information, Seilhan [liquidated his portfolio.] ... By doing so, Seilhan and his family were able to avoid over $100,000 in losses as BP's share price eventually declined 48%. Later, after BP announced it had successfully capped the well, Seilhan repurchased shares of the BP Stock Fund (composed nearly entirely of BP shares) at a lower basis." Mary McNamara, an attorney for Seilhan, said her client wanted to "avoid further distraction and protracted litigation" by settling the matter, according to Reuters. "Mr. Seilhan is widely respected for his work helping to lead the cleanup and containment efforts in the Gulf of Mexico in 2010," McNamara added.